I was recently sent a TurtleMeter from Ozeri and if you have never heard of it is great for moms as it a safe and fun bath toy with a built in thermometer. 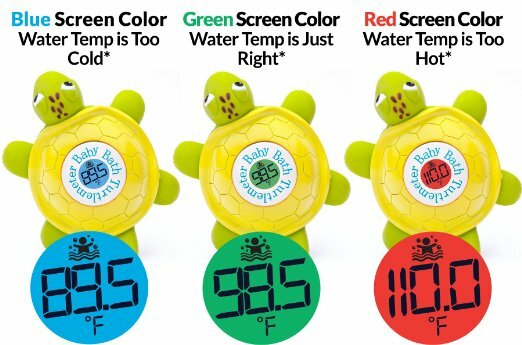 The Turtle meter, the first Baby Bath Thermometer built into a fun and safe Turtle Bath Toy. The Turtle meter activates instantly in water with no annoying buttons or switches. 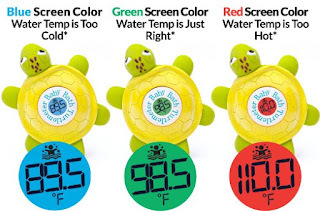 The Turtle meter dynamically calculates the bath water temperature every second, and displays the temperature with 3 different color screens, with Blue indicating Cold, Red indicating Hot, and Green indicating Just Right. Compliant with the Consumer Product Safety Improvement Act, the Turtle meter is safe and fun both in and out of the bath. Ships with 3 AAA batteries included. My Opinion: I think this is a great idea but feel instead of AAA batteries maybe do a solar from the heat or lithium battery. I found it worked well and so far so good without any problems.